to the nonprofit organization of your choice. 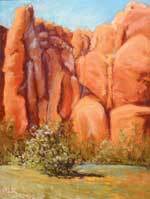 I thought I would share with you the paintings that I completed during Plein Air Moab. This year I did not spend as much time painting for the competition as I did volunteering for the event. In particular, I ran two workshops entitled 'Art Extravaganza'. Those were geared toward introducing people to painting outdoors, with emphasis on kids. My friend, Mary Collar helped me with the first workshop and we had pretty good turnout on both days. Fun. Additionally I took a two-day workshop on water color painting from artists Spike Ress. More Fun. I may do some more water color painting in the future as a result. The three paintings I managed to squeeze in for the competition include one done in oil ('Before The Jet Boats') – and one done in pastel ('Safe Place') and one small oil completed during the Main Street Quick Draw (Hidden Garden). I do not have a very good photo of that last one, which is a shame because it is now sold! If there is any interest in either 'Before the Jet Boats' or 'Safe Place' in exchange for a worthwhile non-profit, please let me know. (Hint: Doctor's Without Borders really needs help right now). May your October be an amazing one. Click images for enlarged versions, then click "close window" to return to this page.